July’s featured book of the month is “Mathematical Puzzles and Diversions” by Martin Gardner. 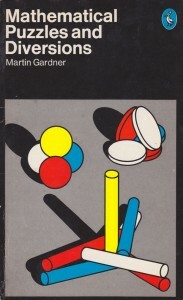 This book, which was originally published by Simon & Schuster in 1959, and later by University of Chigaco Press in 1988, is the first of several collections of Martin Gardner’s column in the Scientific American (by christopher). These books represent a very small proportion of the total writings of Martin Garnder — for a full bibliography go to Martin Gardner’s website.